Not to be confused with The Art Institutes. San Francisco Art Institute (SFAI) is a private, non-profit college of contemporary art with the main campus in the Russian Hill district of San Francisco, California. Its graduate center is in Fort Mason on Pier 2 in the Golden Gate National Recreation Center which originally was an army post. Approximately 400 undergraduates and 200 graduate students are enrolled. The institution is accredited by the Western Association of Schools and Colleges (WASC) and the National Association of Schools of Art and Design (NASAD), and is a member of the Association of Independent Colleges of Art and Design (AICAD). Founded in 1871, SFAI is one of the oldest art schools in the United States and the oldest west of the Mississippi River. 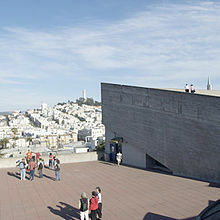 The roof terrace at SFAI's Chestnut Street Campus offers a scenic view over the city. San Francisco Art Institute began in 1871 with the formation of the San Francisco Art Association - a small but very influential group of artists, writers, and community leaders, most notably, led by Virgil Macey Williams and first president Juan B. Wandesforde, with B.P. Avery, Edward Bosqui, Thomas Hill, and S.W. Shaw, who came together to promote regional art and artists, and to establish a school and museum to further and preserve what they saw as a new and distinct artistic tradition which had developed in the relative cultural isolation and unique landscape of the American West. By 1874 the SFAA had 700 regular members and 100 life members, and had raised sufficient funds and the necessary momentum to launch an art school, which was named the California School of Design (CSD). Painter Virgil Macy Williams, who had spent nearly ten years studying with master painters in Italy and had taught at Harvard College before coming to San Francisco, became the school's first director and painting instructor—positions he held until his sudden death in 1886. During Williams' tenure, the CSD developed a national reputation and amassed a significant collection of early California and western fine art as the foundation collected for a planned museum. In 1893, Edward Searles donated the Hopkins Mansion, one of the most palatial and elaborate Victorian mansions ever built, to the University of California in trust for the SFAA for "instruction in and illustration of the fine arts, music and literature." Named the Mark Hopkins Institute of Art, it became San Francisco's first fine art and cultural center, and housed both the CSD's campus and SFAA's art collection. Through this new affiliation, students of the University of California, Berkeley were able to enroll in classes at the CSD. In 1906 the devastating fire following the San Francisco earthquake destroyed the Mark Hopkins Institute of Art building, and the CSD and SFAA facilities, records and art collection. At the time, the replacement value of the building and its contents was estimated at $2,573,000. However, the combined amount of numerous insurance policies yielded less than $100,000 for rebuilding. Nevertheless, within a year, the SFAA built a new but comparatively modest campus in the same location, and adopted the name San Francisco Institute of Art. In 1916, the SFAA merged with the San Francisco Society of Artists and assumed directorship of the San Francisco Museum of Art at the Palace of Fine Arts, which was established to host the 1915 World's Fair, Panama-Pacific International Exposition. In addition, the school was renamed the California School of Fine Arts (CSFA) to better reflect its mission to promote, develop and preserve regional art and culture. In 1926 the school moved to 800 Chestnut Street, which remains the school's main campus as of 2015[update]. In 1930 Mexican muralist Diego Rivera was hired to paint The Making of a Fresco Showing the Building of a City, which is located in the student-directed art gallery. During its first 60 years, influential artists associated with the school included Eadweard Muybridge, photographer and pioneer of motion graphics; Maynard Dixon, painter of San Francisco's labor movement and of the landscape of the West; Henry Kiyama, whose Four Immigrants Manga was the first graphic novel published in the U.S.; Sargent Claude Johnson, one of the first African-American artists from California to achieve a national reputation; Louise Dahl-Wolfe, an innovative photographer whose work for Harper’s Bazaar in the 1930s defined a new American style of "environmental" fashion photography; Gutzon Borglum, the creator of the large-scale public sculpture known as Mt. Rushmore; Rudolf Hess, German Expressionist painter and art critic, and numerous others. After World War II ended (1945) the school became a nucleus for Abstract Expressionism, with faculty including Clyfford Still, Ad Reinhardt, Mark Rothko, David Park, Elmer Bischoff, and Clay Spohn. Although painting and sculpture remained the dominant mediums for many years, photography had also been among the course offerings. In 1946 Ansel Adams and Minor White established the first fine-art photography department, with Imogen Cunningham, Edward Weston, and Dorothea Lange among its instructors. In 1947 distinguished filmmaker Sydney Peterson began the first film courses at CSFA. In this spirit of advancement, in 1949 CSFA Director Douglas MacAgy organized an international conference, The Western Roundtable on Modern Art, which included Marcel Duchamp, Frank Lloyd Wright, and Gregory Bateson. The roundtable aimed to expose “hidden assumptions” and to frame new questions about art. By the early 1950s San Francisco's North Beach had become the West Coast center of the Beat Movement, and music, poetry, and discourse were an intrinsic part of artists' lives. Collage artist Jess Collins renounced a career as a plutonium developer and enrolled at SFAI as a painting student. In 1953 he and his partner, poet Robert Duncan, along with painter Harry Jacobus, started the King Ubu Gallery, an important alternative space for art, poetry, and music. A distinctly Californian modern art soon emerged that fused abstraction, figuration, narrative, and jazz. SFAI faculty David Park, Elmer Bischoff, James Weeks, James Kelly, Frank Lobdell, and Richard Diebenkorn were now the leaders of the Bay Area Figurative Movement, informed by their experience of seeing local museum exhibitions of work by Edvard Munch, Max Beckmann, Edgar Degas, and Henri Toulouse-Lautrec. Students at the school, including David Simpson, William T. Wiley, Robert Hudson, William Allan, Joan Brown, Manuel Neri, Carlos Villa, and Wally Hedrick, continued the investigation of new ideas and new materials, many becoming the core of the Funk art movement. Renamed San Francisco Art Institute in 1961, SFAI rejected the distinction between fine and applied arts. SFAI stood at the forefront of recognizing an expanded vocabulary of art-making that hybridized many practices including performance, conceptual art, new media, graphic arts, typography, and political and social documentary. Students in the early to mid-1960s included artists Ronald Davis, Robert Graham, Forrest Myers, Leo Valledor, Michael Heizer, Ronnie Landfield, Peter Reginato, Gary Stephan, and John Duff and in the late 1960s Annie Leibovitz, who would soon begin photographing for Rolling Stone magazine; Paul McCarthy, well known for his performance and sculpture works; and Charles Bigelow, who would be among the first typographers to design fonts for computers. Alumni Ruth-Marion Baruch and Pirkle Jones documented the early days of the Black Panther Party in northern California. In 1969, a new addition to the building by Paffard Keatinge-Clay added 22,500 sq ft (2,090 m2) of studio space, a large theater/lecture hall, an outdoor amphitheater, galleries, and a cafe. Installation art, video, music, and social activism continued to inform much of the work of faculty and students in the 1970s and 1980s. The faculty during this period included George Kuchar, Gunvor Nelson, Howard Fried, Paul Kos, Angela Davis, Kathy Acker, Robert Colescott, and many other influential artists and writers. Among the students were a number of performance artists and musicians, including Karen Finley, whose performances challenged notions of femininity and political power, and Prairie Prince and Michael Cotten, who presented their first performance as the Tubes in the SFAI lecture hall, and became pioneers in the field of music video. The school became a hub for the Punk music scene, with bands such as the Mutants, the Avengers, and Romeo Void all started by SFAI students. Technology also became part of art practice: faculty Sharon Grace's Send/Receive project used satellite communications to create an interactive transcontinental performance, while Survival Research Laboratories, founded by student Mark Pauline, began staging large-scale outdoor performances of ritualized interactions among machines, robots, and pyrotechnics. Since the 1990s the studio and classroom have become increasingly connected to the world via public art and community actions. As students at SFAI, Barry McGee, Aaron Noble, and Rigo 23, among others, were part of the movement known as the Mission School, taking their graffiti-inspired art to the streets and walls of the city. Faculty and students have created site-specific projects in locations from the San Francisco waterfront (Ann Chamberlain and Walter Hood's monument to the Abraham Lincoln Brigade) to the U.S. Consulate in Tijuana, Mexico (a sculpture by artist Pedro Reyes and SFAI students for the U.S. Department of State's Art in Embassies program). Organizations like Artists' Television Access (ATA) and Root Division, founded by alumni, and SFAI's City Studio program engage and educate local communities and cultivate a vital artistic ecosystem. The school's history was recognized in 2016, when its campus was listed on the National Register of Historic Places. SFAI also offers Low-Residency MFAs, and Post-Baccalaureate certificates in Studio Art. In 2006, SFAI began offering Bachelor of Arts (BA) degrees in the History and Theory of Contemporary Art and a MA degree in Exhibition and Museum Studies and History and Theory of Contemporary Art. Founded by Ansel Adams in 1945, the Photography Department became the first program of its kind dedicated to exploring photography as a fine-art medium. Adams designed the school's darkrooms and attracted photographers for the original faculty, including Dorothea Lange, Imogen Cunningham, Minor White, and Morley Baer, who became Head of the Department after White's departure in 1953. Throughout the SFAI Painting Department's history, it has been home to celebrated artists such as Clyfford Still, Mark Rothko, Richard Diebenkorn, Jay DeFeo, Elmer Bischoff, David Park, David Simpson, Frank Lobdell, Roy De Forest, Joan Brown, Ronald Davis, William T. Wiley, Toba Khedoori, Barry McGee, Inez Storer and Kehinde Wiley among others and was central to movements such as Abstract Expressionism, Bay Area Figuration, Color Field, California Funk, and the Mission School. In 1966, SFAI organized an exhibition of rock and roll posters. Among the many artist musicians who studied at SFAI are Jerry Garcia, guitarist in Grateful Dead; Dave Getz, drummer for Big Brother and the Holding Company and Country Joe and the Fish; Prairie Prince of The Tubes; Debora Iyall of Romeo Void; Freddy (aka Fritz) of the Mutants; Penelope Houston of the Avengers, Courtney Love, actress and rock musician; Jonathan Holland of Tussle; Devendra Banhart. In Summer 2010, SFAI moved its housing program to two locations in Nob Hill: Sutter Hall at 717 Sutter Street, and Abby Hall at 630 Geary Street. Students are given direct access to exhibitions, lectures, symposia, films, and other unique interdisciplinary events. An integral part of campus life, such events connect students to the larger community of artists, art, and contemporary ideas. The Walter and McBean Galleries (on the 800 Chestnut Street campus) house exhibitions, workshops, and other alternative and experimental avenues for presenting work by international contemporary artists. Students also have the opportunity to show their own work in a number of spots on SFAI's two campuses, including the Diego Rivera Gallery. Former board member (1947–1957), Adaline Kent was a sculptor and alumni of the school. Upon her death in 1957, she bequeathed $10,000 for the establishment of an annual award for a promising California Artist. Each year since 1957 the prize was awarded by the San Francisco Art Institute Artists' Committee. Winners included Ron Nagle (1978), Wally Hedrick (1985), Mildred Howard (1991), Clare Rojas (2004), and as the final award, Scott Williams (2005). Fred Martin (artist), beat-era, post-war painter and writer and Professor Emeritus. Bruce Nauman, Process & Conceptual Art. Henry Wessel, Jr. (1972-2014), one of the New Topographics photographers. ^ "City of San Francisco Designated Landmarks". City of San Francisco. Retrieved 2012-10-21. ^ "About SFAI - SFAI". www.sfai.edu. Retrieved 2016-03-11. ^ "Dora Norton Williams: Friend of Robert Louis Stevenson - FoundSF". foundsf.org. Retrieved 26 June 2017. ^ "California Historical Landmark #754: Site of Mark Hopkins Institute of Art in San Francisco". noehill.com. Retrieved 26 June 2017. ^ "1906 Earthquake and Fire Destruction of the Mark Hopkins Institute of Art". www.sfmuseum.org. Retrieved 26 June 2017. ^ "James Kelly -- S.F. abstract expressionist". sfgate.com. Retrieved 26 June 2017. ^ "Frank Lobdell, influential Bay Area painter, dies". sfgate.com. Retrieved 26 June 2017. ^ "History of SFAI- San Francisco Art Institute". sfai.edu. Archived from the original on 10 August 2007. Retrieved 26 June 2017. ^ "sfai history - San Francisco Art Institute". sfai.edu. Archived from the original on 14 December 2012. Retrieved 26 June 2017. ^ "Weekly List of Actions, 1/04/16 through 1/08/16". National Park Service. Retrieved 2016-01-22. ^ "Art + Technology - SFAI". www.sfai.edu. Retrieved 26 June 2017. ^ "Film - SFAI". www.sfai.edu. Retrieved 26 June 2017. ^ "New Genres - SFAI". www.sfai.edu. Retrieved 26 June 2017. ^ "Painting - SFAI". www.sfai.edu. Retrieved 26 June 2017. ^ "Photography - SFAI". www.sfai.edu. Retrieved 26 June 2017. ^ "Printmaking - SFAI". www.sfai.edu. Retrieved 26 June 2017. ^ "Sculpture - SFAI". www.sfai.edu. Retrieved 26 June 2017. ^ ""Exhibitions and Public Programs." San Francisco Art Institute website". sfai.edu. Archived from the original on 19 September 2010. Retrieved 26 June 2017. ^ ""Adeline Kent, 1924" San Francisco Art Institute website". sfai.edu. Archived from the original on 20 December 2010. Retrieved 26 June 2017. ^ (NAGLE, RON) Brown, Sylvia (26 June 1978). "RON NAGLE: 1978 ADELINE KENT AWARD EXHIBITION". San Francisco Art Institute. Retrieved 26 June 2017 – via Amazon. ^ Hedrick, Wally; Rubin, David S.; Hopps, Walter (26 June 1985). "Wally Hedrick: Selected works : Adaline Kent Award exhibition, April 10-May 11, 1985". San Francisco Art Institute. Retrieved 26 June 2017 – via Amazon. ^ "Anglim Gilbert Gallery". www.gallerypauleanglim.com. Archived from the original on 24 September 2015. Retrieved 26 June 2017. ^ "Scott Williams at the SF Art Institute - Stencil Archive". www.stencilarchive.org. Retrieved 26 June 2017. ^ SFAI. "SFAI Announces Faculty Appointments". Archived from the original on 2013-08-10. Retrieved 2013-07-27. ^ Hiro Narita. "Faculty Profile". Archived from the original on 2014-08-31. Retrieved 2014-05-23. ^ Uniondocs. "Sticking with caveh zahedi". Retrieved 2014-01-16.